For your initial visit with us please come in 10 minutes before your appointment time so that you can complete a consultation form. Please note that being late compromises your treatment time and that your treatment will still be charged at full price if you are late. A credit card is required to secure your booking and a deposit of £15 per hour is required for treatments which exceed one hour. Clients are kindly asked to give at least 24 hours notice for cancellation or the full appointment fee will be charged. 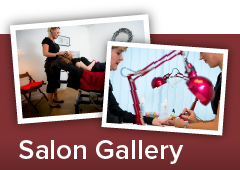 A free and confidential consultation will be carried out prior to any treatments being given. You must inform us, when you make your booking, if you are pregnant or have any illness or condition which may affect your treatment. For your own comfort and that of other clients, we prefer children under 5 not to be brought into the salon. We strive to ensure that we deliver the highest quality service. If you are unhappy with the service you have received, please tell us right away and we will work very hard to fix it. Gift vouchers are available and are the perfect way to treat someone for Birthdays, Anniversaries, Christmas or as a Thank You. Our Gift vouchers are valid for 12 months and are available in any amount for the recipient to spend as they wish.